Our Creamy Luxe Hand Soap is specially formulated with silk proteins, leaving hands super soft, smooth and lightly scented! 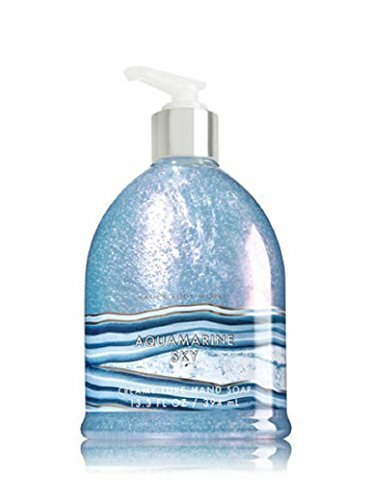 Aquamarine Scent: Cucumber Gardenia (6 oz.) SoapRocks® are an affordable and unique gift that anyone will enjoy! SoapRocks are handcrafted bars. 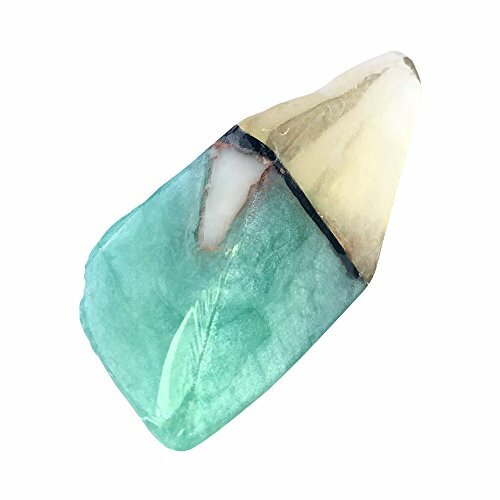 They resemble quartz and other stones such as, Opals, Amethyst, Turquoise, and Citrine, Tigers Eye, Jade, Emerald, Marble and many other precious gems. SoapRocks are very mild and extra long lasting. As they gently cleanse, soap will slowly weather away like a stream stone in geologic time, exposing the beauty locked away within. Since nature cleanses best the manufacturer of SoapRocks uses unique blends of whole herb extracts, vitamins and minerals, from aquatic and botanical sources. All ingredients come together in the biodegradable bases of SoapRocks. Ingredients may include, aloe, calendula, chamomile, comfrey, lavender, vitamin E, vegetable glycerin, chlorophyll, almond oil, jojoba oil, olive oil, essential oils, mineral earth, kaolin clay, and glycerin dewTM. Each soap is unique because they are handmade, they will vary in size, shape and color. Each piece of soap is individually wrapped with a tag. Made in the USA! A unique birthday gift! 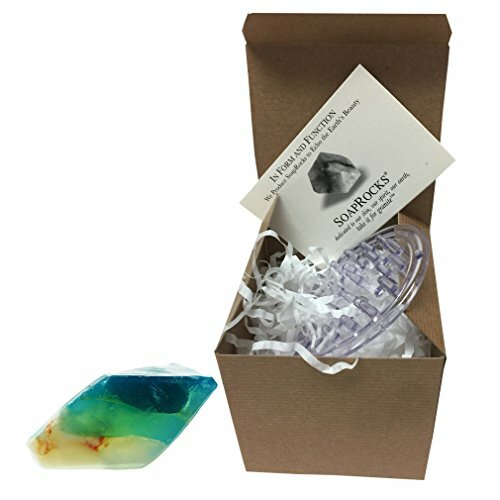 Instead of getting someone an actual birthstone, get them their birthstone in a SoapRock! Pursuit of natural beauty has become the trend of the world's personal care. The normal soap is usually made of ordinary animal oil, to melt and add alkali saponification. While the natural essential oil cleaning soap is used pure plant oil. Natural handmade gemstone soap is the first choice of long-term natural skin care. This is the main reason for the natural handmade soap is so popular in the US and European countries. The natural plant essential oils such as palm oil, coconut oil, almond oil, olive oil etc. are the key ingredients of our soaps. These ingredients can provide the needed nutrients for the skin during the normal physiological functioning. While handmade gemstone soap cleans the skin, it also can soften, smooth, moisturize, deep clean, shrink pores, grant anti-wrinkle effects and acne treatment, etc. Our 'special' ingredient - shea butter. Shea butter oil ("Gold oil") is the most precious skin oils, the usage can be traced to the ancient era of Cleopatra. It's magic for anti-aging, antioxidant effect, skin repair, deep moisturizing and boost the skin's elasticity. It's also known as the emerald in the natural plant oil. Natural soap created as replica of earth's precious stone. Made from mild, extra long-lasting vegetable glycerin. Bar lights up under water, and over many uses, slowly weathers away in your hands like a stream stone in geologic time. For All Skin Types, including sensitive. Can be used daily on chapped, dry and/or rough skin. 4 oz. size. Eco-friendly. USA Made. No Animal Testing. Vegetable Base. Place soap on soap dish. Great addition to any sink or bath. Fragrance: Cucumber Gardenia. INGREDIENTS: Almond Oil, Aloe, Calendula, Chamomile Oil, Chlorophyll, Comfrey, Jojoba Oil, Kaolin Clay, Lavender, Mineral Earth, Olive Oil, Vegetable Glycerin, and Vitamins A & E. Discontinue use if irritation develops. 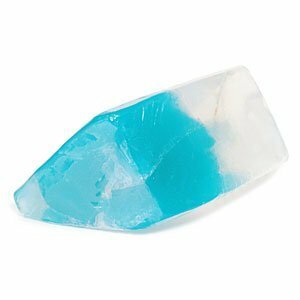 Gentle, finely-crafted, glycerin soap designed to look like precious gemstone Aquamarine. Creates a rich lather and are as fragrant as they are beautiful. Each Soap RockSoap is 6 oz.Aquamarine means sea water and both the gemstone and our soap is the color of a Grecian sea at noon. This soap reflects water in every way, and its allure will diminish like the allure of a stone in the tide. Fragrance: Cucumber Gardenia. 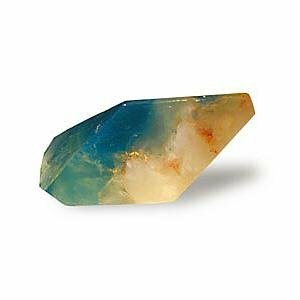 April Birth stone. INGREDIENTS: Almond Oil, Aloe, Calendula, Chamomile Oil, Chlorophyll, Comfrey, Jojoba Oil, Kaolin Clay, Lavender, Mineral Earth, Olive Oil, Vegetable Glycerin, and Vitamins A & E. Discontinue use, if irritation develops. 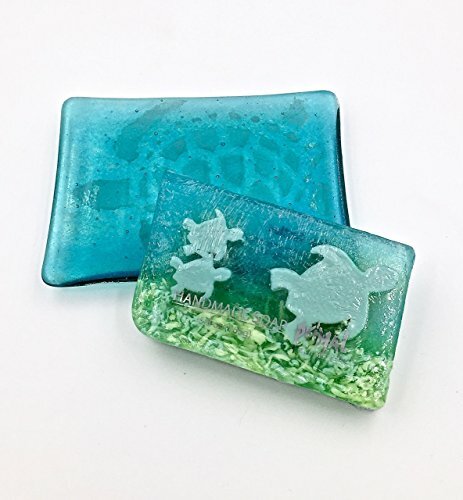 This is an iridized aquamarine fused glass decorative plate soap dish with a subtle sea turtle design sandblasted onto the surface. It has raised ridges to allow the soap to dry and drain. It is 6mm thick and is 4" wide x 5.5" long. Makes a bright and colorful bath accessory on a bathroom counter or in a coastal decor. A 5.5 ounce bar of Sea Turtles Primal Handmade Soap is included. The soap has a fresh coconut lime scent. It makes a welcome gift, whether for a birthday, wedding, bridal shower or housewarming. It also could be used for a staff appreciation award. A matching trinket dish is also available in my store. You will receive the soap dish and soap in the photo. Comes gift wrapped in a black box with boutique-style tissue and silver ribbon for ease in holiday gifting. Duke Cannon Men's Bar Soap - 10oz. Big American Brick Of Soap By Duke Cannon - Naval TriumphWe All Know That Size Matters - Especially When It Comes To Soap. 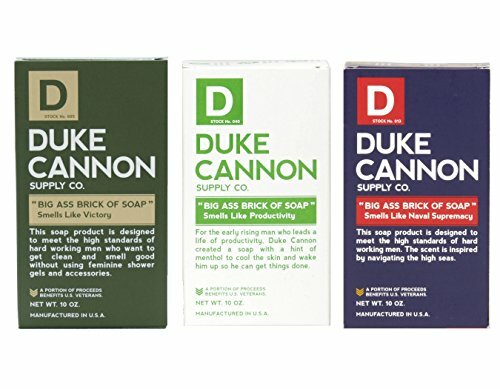 Being Three Times The Size Of Regular Soaps Means That Duke Cannon Is Going To Last A Lot Longer Than Most Competition. It’s Triple Milled For Highest Quality, And Has Steel Cut Grains For Texture And Exfoliation (Manly Gripability). 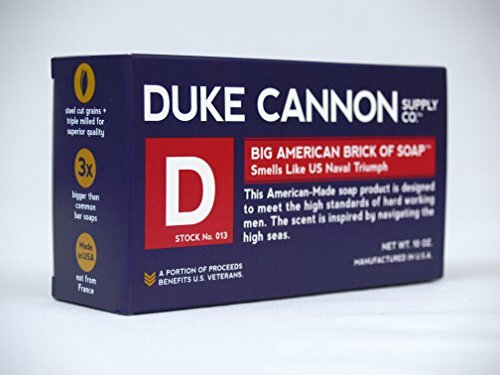 Duke Cannon’s Big American Brick Of Soap Is Modeled After Soap Used By GIs In The Korean War, And Are Field Tested By Active Duty U.S. Soldiers. Perfect For Everyday Masculinity, Or A Gift Every Man Will Actually Love. Made In The U.S.A. With A Portion Of Proceeds Supporting Veteran’s Causes.